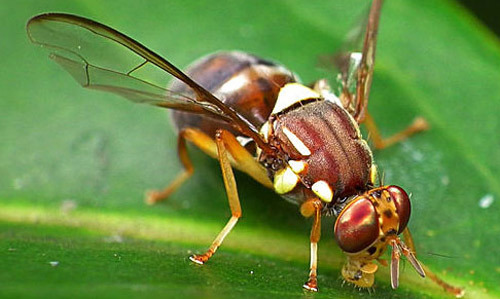 The Queensland fruit fly, Bactrocera tryoni (Froggatt), occurs in climates ranging from temperate to tropical. Within its range, it is one of the most important pests with which pome and stone fruit growers have to contend, and at times it has been a very destructive pest of citrus. Bactrocera tryoni appears to be almost as destructive to fruit production in its Australian range as the oriental fruit fly, Bactrocera dorsalis Hendel, is in countries where it appears. Figure 1. Adult Queensland fruit fly, Bactrocera tryoni (Froggatt). Photograph by James Niland. A heavy outbreak of B. tryoni in New South Wales during 1940-41 resulted in the rejection of 5–25% of citrus at harvest. It is not established in the United States, but the extensive damage caused by the larvae of this fly in areas similar to Florida indicates that this species could become a serious pest of pome and stone fruit crops, and possibly of citrus, if it were to become established in Florida. In Australia, the Queensland fruit fly inhabits parts of Northern Territory, Queensland, New South Wales and the eastern corner of Victoria, with outbreaks in South Australia. In 1989, B. tryoni became established in Perth, Western Australia, but an eradication campaign using baits, male lures and sterile insect techniques eradicated it (White and Elson-Harris 1994, CSIRO 2004, GISD 2011). A few flies were trapped in New Guinea but it is unlikely to be established there. Occasional flies are trapped in the Austral and Society Islands in the Pacific. It is now widespread in New Caledonia, French Polynesia and Pitcairn Islands. It was twice detected on Easter Island, but eradicated (White and Elson-Harris 1994, GISD 2011). Immature stages are similar in appearance to those of other Bactrocera. The adult female is approximately 6 mm long, has a wing expanse of 10 to 12 mm, and has mostly transparent wings marked with brown. The fly is brown marked with yellow. On the thorax a broad creamy, often pale, dorsal band runs down the scutellum, and there is a well-defined narrow pale yellow stripe on each side. The humeri, or shoulders, are pale yellow, also. The abdomen is constricted at the base, flared in the middle, and broadly rounded at the tip, not counting the ovipositor of the female. Figure 2. Larva of Queensland fruit fly, Bactrocera tryoni (Froggatt). Head to the right. Figure 3. Adult female Queensland fruit fly, Bactrocera tryoni (Froggatt). Bananas are said to be attacked only when overripe, and other fruits, such as grapes, are attacked only in peak years. Wild hosts include passionflower, Passiflora spp., and Eugenia spp. (Myrtaceae). Males attracted to cue lure (White and Elson-Harris 1994). Christenson LD, Foote RH. 1960. 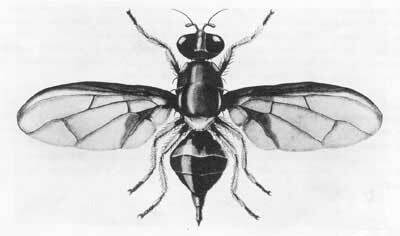 Biology of fruit flies. Annual Review of Entomology 5: 171-192. Oakley RG. 1950, January 30. Fruit flies (Tephritidae). Manual of Foreign Plant Pest for Fruit Flies, Part 3, p. 167-246. USDA, Survey and Detection Operations, Plant Pest Control Division, Agricultural Research Service. Anonymous. 1957. Insects not known to occur in the United States. Cooperative Economic Insect Report 7: 1-687. Queensland Fruit fly (Dacus tryoni (Frogg.)). p. 35-36. Originally published as DPI Entomology Circular 34. Updated for this publication. Publication Date: January 2002. Latest revision: July 2014. Reviewed: December 2017.